Obviously, the notorious speech of Dmitry Medvedev on America's missile defense deployment in Europe had plain pre-election nature, and measures offered in his statements were kicked off long ago (besides, some of them are related to that European missile defenses quite indirectly). Meanwhile, degree of debates on that issue permanently grows up. Remarkably, in that polemics Russian Navy is not mentioned either as counterbalance to the US missile defenses or as a platform for aerospace defense which is also much talked about. As was repeatedly written by Independent Military Review (for one, in the article "Useless Missile Defense: Artificial Reality" published on July 22, 2011), even if any element of US missile defense could be a threat to Russian strategic nuclear force, that would be definitely a sea component. American ground-based missile defense systems (deployed in Poland, not to speak about Romania) cannot reach our ICBMs, since abolishing of physical laws is still beyond Washington's power. But missile cruisers and destroyers armed with Aegis system can easily enter Arctic seas (if ice melting continues) and be stationed under tracks of Russian ICBMs. Given that Standard-SM3 surface-to-air missiles are modernized, they would be capable to intercept our intercontinental ballistic missiles at midcourse phase, and SLBMs launched by Northern Fleet strategic submarines – even at boost phase. In addition, with modernized Standard missiles, American warships deployed in the US-adjacent waters will be able to intercept Russian warheads at descent phase. In today's US Navy, all 22 Ticonderoga-class cruisers and all 60 Arleigh Burke-class destroyers are armed with Aegis system; construction of the latter ones is in progress (totally, it is planned to build 75-99 destroyers). Five cruisers and 16 destroyers out of abovementioned force have advanced Aegis system which is capable to perform missile defense but not only traditional air defense. Presumably, in prospect all US Navy's cruisers and destroyers will undergo such modernization. At present, they execute some tasks of theater missile defense (for instance, in the Persian Gulf), and if new modifications of Standard missile are effectively developed, they could be used for strategic missile defense. What is more, as was written in the article "Who Would Suffer More If Talks Fail" (Independent Military Review, published on June 3, 2011), in Russia discussion of the US missile defenses deployed in Europe is detached from real scenarios. Actually, American interceptors may threaten Russian strategic nuclear force only if our missiles are already launched against targets in the US, i.e. when a full-scale nuclear war starts. In this regard, it would be good to find out in what conditions it may happen. Variants of Russia's aggression against the US, America's first nuclear strike or NATO's conventional strike against Russia are so unlikely that there is no point to discuss them. The only variant which probability is a bit higher than zero is that the US delivers preemptive strike against our strategic nuclear force by sea- and air-based cruise missiles in view that the rest of that force would be shot down by missile defenses. In this case, that would be primarily an attack from the sea, from abovementioned cruisers and destroyers, and submarines of Los Angeles, Virginia, and Ohio types. Thus and so, if we are really afraid of America's strike and missile defenses, Russian Navy must play key role in countering of that threat. It is vital both from the viewpoints of defeating American nuclear submarines and surface ships, and creation of a sea-based air/missile defense barrier capable to weaken the US strike before Tomahawks reach Russian coasts. However, as was said above, for some reason Russian Navy is not mentioned at all in this aspect. This oddity can be explained by three things. Either our military and political leaders have certain problems with strategic vision, or all those hysterics over missile defenses has purely political nature and is used exclusively "for home consumption", or our Navy is in such miserable state that by no means can counter the mentioned threat. Properly speaking, none of those three variants eliminates the other two. Debate on the first and second variants may be not only of political but absolutely rhetorical nature, and thus it is purposeless. So, let us proceed to the third variant. And it becomes apparent at once that Russian Navy – in contrast to the US one – cannot establish any sea-based missile defense barrier at all and won't be able to in any foreseeable future. We haven't anything even vaguely resembling Aegis system either. Presently available and being constructed surface ships can only defend themselves from air attacks, perhaps a bunch of neighbor ships or convoy, but not protect the country from a missile strike from the sea. Four missile cruisers – Project 1442 nuclear-powered Petr Veliky and three Project 1164 (Moskva, Marshall Ustinov and Varyag) – seem to be an exception. In Russia, they are wrongly considered a sort of analogs to American ships. But the point is that Aegis is not only a set of different missiles but a complex integrated system. And what our cruisers have is only a set of missiles. For one, Fort SAM system which is a ship-based analog of S-300P. Although missiles of this system yield to Standard ones, they are quite capable to intercept cruise missiles. But amount of operable missiles is incommensurable. It was said above how many cruisers and destroyers the US Navy has. By the way, all missiles are permanently ready for launch (up to 122 on every cruiser and up to 90 or 96 on every destroyer). Our Petr Veliky is armed with 96 surface-to-air missiles, and only 12 of them are ready for simultaneous launch; Project 1164 ships have 64 missiles each with only 8 ready to be launched at once. Besides, those ships are scattered to different fleets. Moskva is stationed at Black Sea Fleet, Varyag – at Pacific Fleet, Petr Veliky and Marshall Ustinov – at Northern Fleet. Construction of new ships of those classes in Russia is out of question. No wonder, we have neither financial nor technical capabilities for that. Even the US shut down a new cruiser development program due to financial reasons, not to speak of Russia. However, our Navy could repel or at least weaken the preemptive strike by other means – attacking sea platforms of cruise missiles. Besides, considerable part of them carries ICBM interceptors as well. So, by destructing a US cruiser or destroyer we could kill two birds with one stone. Russian Navy has better chances in this area. Obviously, our fleet by no means can pose a threat to American nuclear-powered cruise missile subs. Even in the Golden Age of Soviet Navy its antisubmarine capabilities were quite low, now submarine defense is barely maintained in close proximity to home bases. But enemy's surface ships could be easily attacked by our nuclear and diesel submarines, surface combatants (mostly, by abovementioned cruisers and still in-service Project 956 destroyers), and coast-based aviation. Possibility of such strikes in itself would significantly depreciate capability of US warships. To counter this threat, Americans would have to charge VLS Mk41 with antiaircraft Standards and antisubmarine ASROKs instead of Tomahawks and ICBM-intercepting Standards. 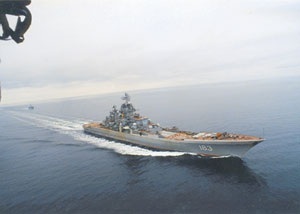 However, Russian Navy is equal to such heroism only nearby home coasts, in Arctic seas. As was said above, the biggest problem American cruisers and destroyers could pose is to intercept warheads of Russian ICBMs and SLBMs by upgraded Standards nearby the US coasts. They would be beyond the reach of our surface ships and aviation then. Of course, Russian ships are capable to gain that shore, but in the absence of aviation that would be tantamount to worthless suicide. Only nuclear submarines have a chance of success. Thus, the most adequate reaction on America's missile defense is recently signed contract for 4 Project 885M Yasen nuclear-powered submarines (in addition to SSGN Severodvinsk passing trials and SSGN Kazan being built for 2 years). Sure, that is not enough, but unfortunately the process cannot be speeded up. The reason is same – lack of money, competent staff, and production capacities. As was said in the beginning, authors of the president's "historically rigid" speech on missile defenses put in his mouth those "countermeasures" which are either being implemented or planned. Moreover, part of them has no relation to the problem. Nothing hindered to add four Yasens to that list. Those "big fishes" must have problems with strategic vision and not a second believe in own "chillers" about missile defenses. Or maybe it's a kind of a war ruse?